ROTARY BLOWER / VACUUM PUMP TYPE "ARJ"
The Unozawa "ARJ" Positive Displacement Blower is new series Roots blower developed by incorporating extensive experience and technical experience. This series blower type "ARJ" employs three lobe rotor, featuring higher performance, lower noise and less vibration. When the blower, which handles specials gas, mechanical seal can be provided. High design pressure blowers are available up to 20 barg. Pneumatic conveyor, Chemical process, Air source for power handling. Gas circulation for Chemical industry. Filtration for Chemical industry, Pneumatic conveyor, Unloading of powder handling. The casing made of cast iron, consisting of the upper suction and the lower horizontal discharge sections, ensures sufficient strength and durability. The three lobe rotor made of cast iron or Ductile cast iron has good quality subjected to high precision machining. The inside clearances are precision matched and optimum efficiency is guaranteed. In addition, as it is perfectly balanced by means of dynamic balancing machine, noise and vibration are minimized. The bearings are high precision bearing with load capacity suited for working conditions. Stable performance and long service life are guaranteed. 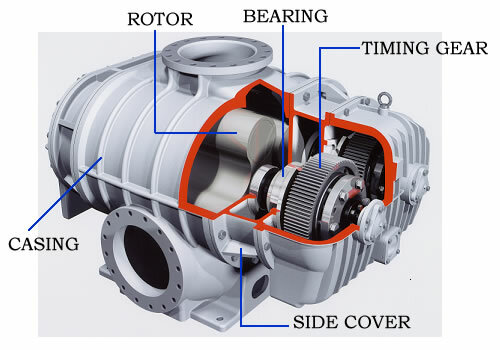 Special considerations have been given to the timing gear, since it is important part of blower as the rotor. Made of chrome molybdenum steel, carbonized, quenched and ground, it is excellent in durability. The side cover function as an intermediate chamber between the casing and oil cavity for the bearing/gear. As the side cover has seal system, it prevents lubricating oil from leaking into the casing. The timing gear and bearings on both side are subjected to splash lubrication by oil bath. In order to ensure ideal lubrication, oil is used. Depending upon service condition, cooling water path can be provided on both oil cavities. Pair of rotors turn in opposite directions inside the casing, maintaining a precision clearance between the side wall of the casing and the two rotors. Gas flows into the blower as the lobe end and of each rotor passes the suction port. And gas is transferred from the suction side to the discharge side. It is then discharged, forced towards the high-pressure side. Gas at the suction side is caught in volume "V" surrounded by rotor tips (A), (B) and the casing in process as shown in illustrations (1) and (2) at right, and after step (3), (4) and (5), is discharged. With three lobes, this process is repeated six times per one rotation and constant volume of gas proportional to the number of revolutions are discharged. For more information, Please ask our catalogue. The blower can be used for force-feed and circulation of gas in the chemical industry process. The gases to be handled are hydrogen, nitrogen, acetylene, oxygen, petroleum gas, methane, sulfur dioxide, flue gas, town gas, carbon dioxide gas, hydrogen sulfide gas, hydrochloric acid gas, etc. Materials Cast iron, Ductile cast iron, Stainless steel, Cast steel. For higher pressure application is available up to 20 kg/cm2G (2.0 MpaG).